He may not take too much solace from it, and in light of the very bad night he had on Saturday against the slicker than slick Billy Joe Saunders, in front of his home crowd, David Lemieux can’t be expected to – but the former champ is still on course to take something away from 2017: The KO of The Year Award. It was back in March of this year when the former IBF middleweight king squared up with Curtis Stevens in another grudge-match. What was widely anticipated to be a war, one that either puncher may win, instead turned out to be one sweet night for Lemieux. It was in the third-round when it happened: Stevens, on the ropes and throwing a left hand, got beaten to the punch by Lemieux, who scored with a scorching left hook of his own that landed flush on Stevens’ jaw, sending him out like a light the split-second it found its home. Stevens, a damn fine fighter, went down in quite alarming fashion and he stayed there, motionless on the canvas for a few worrying minutes. In fact, Stevens – who had in a previous fight taken middleweight king Gennady Golovkin’s best punches and, despite being put down early, had gotten back up – had to be carried away via stretcher after sharing a ring with Lemieux. 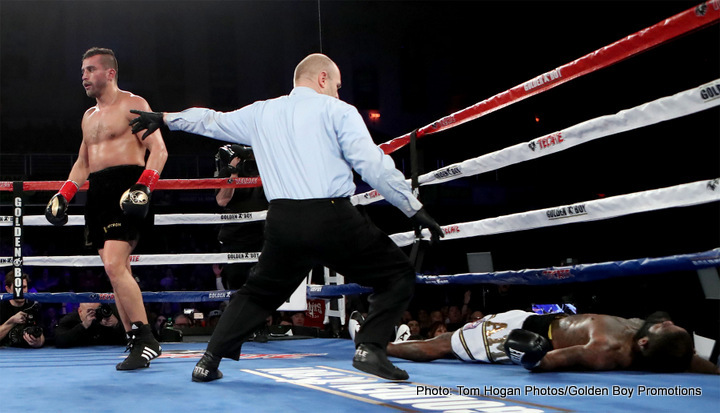 Nobody enjoys seeing such a spectacle (nobody possessing a sound mind, anyway) but all who watch boxing know these kind of brutal knockouts can happen at any time, in any fight. It’s not too often we do get to see such lethal one-punch power, but it sure resonates when it does happen. It was the kind of gale-force punching Lemieux displayed back in March that swayed many fans into thinking the Canadian would despatch Billy Joe Saunders in a similar fashion on Saturday. But no, that kind of KO was proven to be a once a year achievement from Lemieux. Still, at least the former champ who now has a serious rebuild job ahead of him can take something away from this, an overall disappointing year for Canadian boxing. Have we seen a more brutal KO, of the one-punch variety, this year? Maybe you can argue a case for one other than Lemieux’s, but chances are high the boxer with the sport’s coolest haircut will indeed walk away with 2017’s KO of The Year trophy.